Webster Athens students planned and organized the party, transforming the center into a festive wonderland for over 100 refugee children. Dressed in their Webster University Athens t-shirts and armed with bags of toys and supplies, Webster students and students in the Odyssey in Athens program again helped make refugee children's holiday with a special visit on Dec. 14. The students marched to the Caritas Refugee Center to decorate for the children’s holiday celebration. Under the guidance of the Office of Student Affairs, this was the second year Webster Athens students planned and organized this party. They transformed the center into a festive wonderland, ready for a party that took weeks of planning. Over 100 children, accompanied by their parents, were in attendance. When they entered the center at mealtime, they were delighted to see the decorations and balloons, and they couldn't stop smiling for the rest of the event. “The party for the refugee children made me realize that the world is bigger than me," said Elijah Rodriguez, a student attending through the Odyssey in Athens program. "The world isn’t always rainbows and sunshine, but for one day we made it possible." 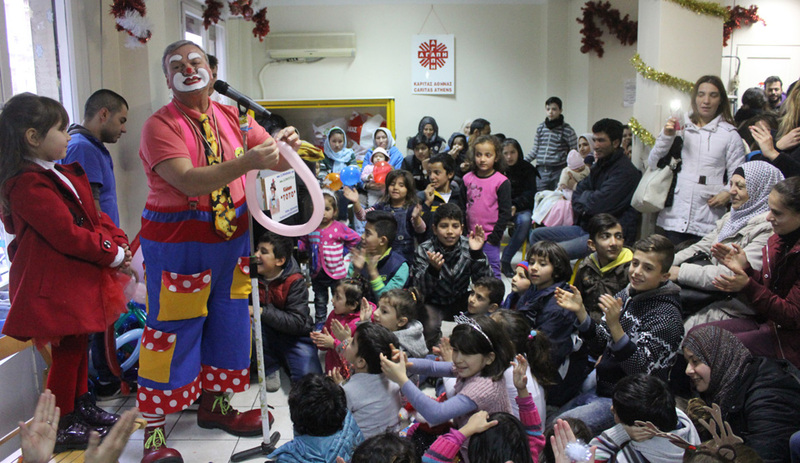 Children ate pizza, played games and danced with students, in addition to being entertained by Toto the Clown, who once again stole the show by involving them in his performance and making animals and designs out of balloons. This was a special day for the children, as they do not often have opportunities such as this to play and interact with each other. They have left their countries due to war and are forced to live in substandard conditions in refugee camps and squats here. It was a day they will never forget. The children never stopped smiling during the party, especially while being entertained by Toto the Clown. The fundraising for the party was accomplished by the students. During the semester, they all volunteered their time at Caritas and the Jesuit Refugee Centers, where they got to know some of the children and their families very well. They were determined to make this event special and reached out to family and friends back home for donations. 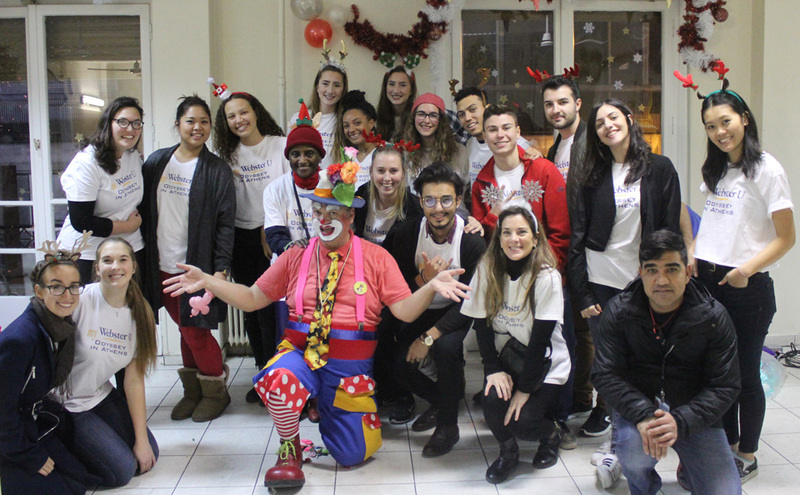 Alumni of the Odyssey in Athens program, who also had done similar work during their study abroad experiences, also contributed to the fundraising efforts. With the money raised, they were able to purchase toys, decorations, supplies, food and beverages for the children and their parents. In addition, they bought fresh fruit and vegetables, eggs, chicken, oil, yogurt, bags of lentils and chickpeas, tea and sugar, diaper and diaper wipes, cookies and crackers, as well as cleaning supplies and sanitary items, for one of the refugee squats that house roughly 600 refugees. Other donations of coloring books and crayons for the party were collected last spring on the home campus by Webster University librarians Kathy Gaynor and Holly Hubenschmidt. This year, the role of Santa Claus was played by Tom Mazarkis, director of Operations at Webster Athens. The children did not want to leave his side and insisted on taking photos with him. As each child left the party, "Santa" gave each child a gift bag with various toys, coloring book, crayons, candies and tangerines. The party came at the end of the semester with only a few days before the students departed to return to the U.S. It was the finale to a very busy semester of academics as well as cultural activities such as the Greek cooking classes, where the students learned to make some favorite Greek dishes. They also went on field trips and excursions to archaeological sites and museums around Athens and other Greek locations, where they learned firsthand about the significance of each site visited. They toured the Hellenic Parliament and heard about the Greek political system. As they viewed Parliament in session, the President of the Parliament announced their visit in Greek and English and the parliamentarians applauded them. After the session, they were given a summary of what they viewed. Also, this semester was special for some, as they had a once in a lifetime opportunity to see U.S. President Barack Obama speak during his visit to Athens. To view photos of the event, excursions and activities throughout the semester, visit the Webster Athens Facebook page. Learn more about programs for study in Greece here.